October is Talk About Prescriptions Month. It’s a good time to sit down and look at the medications your parents take. Make a list that you can share with any family caregivers, your parents’ doctors, and the pharmacist. You should also look up each medication and create a list of questions if there are things you don’t understand. Why Are You Taking It? Doctors may prescribe a medication that you’re not sure is worth the cost. One example is Alzheimer’s medications. They can slow the symptoms, but they can’t stop the disease. If your dad reaches a point where he’s bedridden and no longer eats, you may find the cost of the medication outweighs the benefits at that point. It’s a good conversation to bring up with a neurologist. Does the Pill Look Right? It’s not common, but pharmacists can make mistakes. The use of electronic messaging has changed this. Doctors now send prescriptions to a pharmacy through computers. That doesn’t eliminate all mistakes, however. Prescription medications are developed, packaged, sent to distributors, and delivered to medical offices or pharmacies before reaching patients. In 2018, a company mistakenly packaged spironolactone in hydrochlorothiazide bottles. Both are blood pressure medications, but one is not meant to be used in people with certain heart conditions. By checking the pills you have in hand with pictures you find online on a medical website, you’ll know if the pill looks correct. You can compare the recommended dosage with what’s on the label and see if that matches. If something looks wrong, call the doctor before your parent takes the medication. Most medications have contraindications. These are safety measures put in place to keep a medication from being ineffective or dangerous. For example, drinking alcohol while taking antidepressants can alter the effectiveness of the antidepressants. Is There an Ideal Time to Take These Pills? 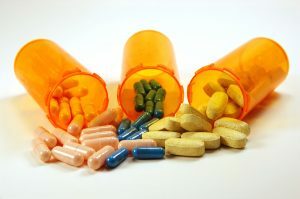 Some medications have to be taken at specific intervals. Antibiotics are an example. You take them a set number of hours apart to keep the level of the medication steady all day long. Is There a Risk of Overdose? As your parents age, you may find them struggling to remember if they took their medications. Many seniors will take an additional dosage if they don’t remember taking them. This can lead to an overdose. Avoid this by hiring elder care services to offer medication reminders. In addition to medication reminders, caregivers can pick up prescriptions with your parent, phone in refill requests, and schedule appointments with the doctor.